If you are a business owner or webmaster looking to get more business from Google search please feel free to reach out to me at jwojdylo@gmail.com. I offer several packages that can help you get more searches which, in turn, will help you get more customers. UPDATE: Our 2016 Google algorithm predictions have been published. Check them out! In July 2014 there was a major algorithm update related to Google Local search results. That particular update, deemed “Pigeon” by some, was focused on the Google Local search results that show up for business related keywords. An example would be “Chicago Personal Injury Lawyer” or “Atlanta Car Dealership”. After some shake out it looks as if this particular update is encouraging businesses to build out a web presence on an individual domain. From day one I have said that a business or brand should focus on their website first before trying to promote a Facebook, Twitter, Google Plus or business page owned by a social media or Internet company. As you can clearly see, this was not a gradual decline, it was a sudden drop. The author of article admits that he had sought out links from private blog networks (PBNs) that would not be considered high quality links. Over the last several years Google continues to hammer sites that have obtained links from article marketing websites or blog networks. If anyone can sign up to write a blog post, for a website, there is a good chance that link is going to be deemed invaluable. More importantly, that link could be detrimental in that a future algorithm update may not only discount this link but it may get you penalized for thin content or no added value. Even if you have a website with amazing content you could be hit with a Google algorithm penalty if you have obtained links from websites that have thousands of outbounds links; sometimes tens and hundreds of thousands. How Does Google Detect Private Blog Networks? 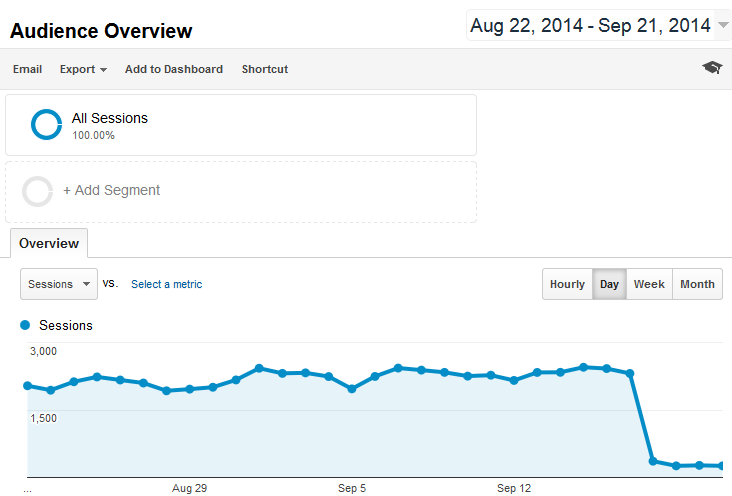 Can I Recover From the September 2014 Google Penalty? Will My Website Get Its Traffic Back? Just the other day, one of my friends that does SEO for doctors, dentists, real estate agents and lawyers asked me how Google could detect private blog networks or article marketing websites. This is likely not very hard for Google. Any algorithm is a numbers based system. If a particular website has 100 articles and those 100 articles have 1500 outbound links to websites of many different niches it is obvious what is going on. That means each article is linking to 15 different websites. Google can also detect what type of websites the outbound links are pointing to. If they are all spammy websites that have obtained thousands of links in the past few months it is blatantly obvious this is not the type of quality that should rank on the front page of Google. While many claimed SEO “gurus” and “experts” will say they have a strategy or system to outsmart algorithms and search engines they are fooling themselves. Sadly, they are fooling many business owners as well. If you are a business owner or you have a website that makes money think logically before allowing someone to “mess” with your link portfolio. If you have 25 pages or blog posts on your website do you honestly believe this domain deserves 500 linkbacks? Are your articles worth 20 linkbacks each? There are some very respectable business owners, entrepreneurs and bloggers that can definitely garner 20 links per post but they have built up a reputation over time. It doesn’t happen overnight. In fact, sometimes it never happens. Some of my most successful websites have 25 to 50 links total, in several years of content. These websites rank #1 for competitive keywords and I have never had issues with a Google algorithm penalty. That said, the content that goes on these websites is completely original and well written. It is also valuable to the readers and visitors of the website(s). You can recover from any penalty with the right actions. That said, it is not easy. If you or your business website has obtained thousands of links from private blog networks you have some work to do. It may be a full time job just cleaning up these links. Fortunately, Google will always give you a second chance. If you would like to better understand the action steps to get your Google search traffic back please feel free to email me at jwojdylo@gmail.com. We can discuss some of the proper ways to create quality content and obtain 100% natural links. The best SEO ever is unique, quality content. If you or your website is not creating unique, quality content it is going to be extremely difficult to rank on the front page of Google search. While search signals matter and links will always be important it remains to be the case that content is king. As a business owner it is sometimes wise to hire a content writer or copywriter to help with the growth of a website. Publishing three to five blog posts a week is the best SEO money can buy. This is not debatable. In fact, I would say that content is the best online marketing investment money can buy. Set aside a marketing budgeting for content and you will benefit greatly in the months and years ahead. If you continue to think of SEO as magic and the secret is to get links or Facebook likes your website will never recover. If you decide to hire a company to clean up your links and provide “quality” SEO you must ask them if they are willing to create content. If this claimed SEO company is not producing weekly content for your website it is highly unlikely you will see your traffic recover to pre September 2014 levels. I have seen it time and again; when Google hits a website with a penalty the website must take the proper steps to recover and prove to Google they are a valuable resource to both visitors and readers. Another quick way to determine the reputability of an SEO company is to search some of the keyword phrases they should rank for. If you Google their business name and they are not #1 on Google it is time to look for other options. Feel free to contact me at jwojdylo@gmail.com and I will give you an honest assessment of a website or SEO company that claims to clean up bad links that caused a Google penalty. If you have the desire to rank higher in Google search and get business from these search results that is a service I offer. If you are seeking personal injury lawyer SEO or mortgage broker SEO do not hesitate to contact us today. We have worked with attorneys and brokers all over the United States and they have all increased their search traffic. Interesting. So are you saying that even though Sept 18th wasn’t a Penguin update it still relates to links? You don’t specify anything else other than PBN’s as being the likely cause. Can you elaborate further? Were the PBN’s taken down? Which PBN’s were affected? Were any messages sent out in WMT? Is anything else the likely cause or could have contributed?